The Library is a good place to find quiet study areas — but sometimes you need to work on ideas out loud. We can accommodate this too! Work on group projects or hold study sessions with your classmates in one of our group study rooms, located on the third and fourth floors. Falvey has six study rooms available for groups of two or more. All rooms have network connections for laptop use and a chalk board. To use a group study room, ask for a key at the Circulation Desk. You will need to present Villanova Wildcards from at least two group members. Rooms are available on a first come, first serve basis. Reservations are not taken. The study room may be used for up to 2 hours per group while others are waiting. In consideration of others, we ask that you leave the room in good condition. Priority for study room access is given to Villanova University students, staff or faculty. Please note that eight weeks prior to final exams, the Library adjusts the group study room policy to restrict use only to undergraduates and non-law graduate students. For further information, contact Circulation Desk staff at 610-519-4270 or via e-mail. 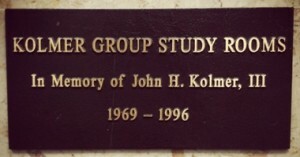 Four of the 6 rooms are officially known as the Kolmer Group Study Rooms. The family of John H. Kolmer, III, funded renovations of the rooms in honor of his memory.